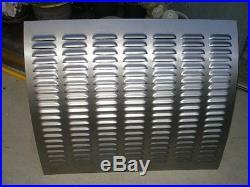 Louvered Rod Gasser Rear Deck Lid "Model A" 4 louver 7 rows Square Pattern. Classic louvered Rear Deck Skin louvered panel made for a Model A. A total of 147 Louvers! Let me know if you would like me to leave a louver out of the center row at the top or bottom if you have a rumble seat or trunk handle you would like to put there. The louvers are made on a high tonnage press brake for much crisper stronger forms (see photo). This is much easier and less expensive than having your fender, hood, panel or firewall removed and taken to the body shop and louvered. Just trim this panel to fit your and weld (see photo) epoxy or rivet in place(no edge bends). These are made from 20ga cold roll steel. The louvers are 4 1/32 wide and 3/8 tall. The spacing is 1 1/4. This panel has 7 rows of 21 louvers. The panel has plenty of flange room so you can trim to fit. The outer dimensions are 36 5/8"W x 32 H". Please let me know if you need me to leave out a louver for your handle! On Vintage Old School American made equipment! 1st four photos are of the Model T Louver deck lid the others are. Some comments from past Louver Plate buyers. Made me several custom panels that are perfect. Good deal I will need more of these , very well made. Really nice, will probably get another pair soon. Great parts good prices and wonderful service. 5 STAR all the way! Will recommend to my Jeep friends! Got them out at the house awesome! Very nice work, thank you. The item "Louvered Rod Gasser Rear Deck Lid Model A 4 louver 7row Square style Rodlouvers" is in sale since Wednesday, March 26, 2014. This item is in the category "eBay Motors\Parts & Accessories\Car & Truck Parts\Exterior\Other". The seller is "dkt1234" and is located in Bonsall, California.